= Ashita wa kinjo no inu to goukon ga arundayo. = You know I have a group date with neighborhood dogs tomorrow. Hi everyone! Today’s special guest teacher is Flama-sensei, from Cataluña. She is our friend and a really sweet doggie. = I am Flama. Nice to meet you! Maggie Sensei made two Time Related lessons in past. I heard some of you still have a hard time figuring out what time expressions need a particle. Let me help clear that up today. ★Time expression with に ( = ni): To do something at a specific time / on a specific day, month, year. = Itsumo goji ni shigoto ga owarimasu. = I always finish working at five. = Ashita no rokuji ni oukagai shimasu. = I will visit you at six tomorrow. = Ashita wa, nanji ni irasshaimasu ka? = What time are you coming tomorrow? = Mokuyoubi ni mata kimasu. = I will be back on Thursday. = Raishuu no kin’youbi ni shiken ga aru. = I have an exam next Friday. = Rokugatsu tsuitachi ni kekkon shimasu. = I will get married on June 1st. = Tsugi no konsaato wa sangatsu ni arimasu. = The next concert will be in March. = Kono ie wa sen kyuhyaku gojuu nen ni taterareta. = This house was built in 1950. 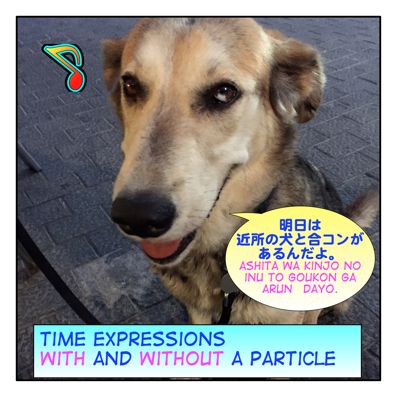 ★ You don’t usually need the particle に ( = ni) with the followings time words because they already function as an adverb. Note: There are cases that you use に(=ni). I will explain when to use it later. Ex. I will be back tomorrow. = Ashita ni mata kimasu. Ex. I have an exam next week. = Raishuu ni shiken ga aru. = Raishuu, shiken ga aru. Ex. I buy flowers everyday. = Mainichi ni hana wo kaimasu. = Mainichi, hana wo kaimasu. Ex. I got married last year. = Kyonen ni kekkon shimashita. ★ You sometimes need に ( = ni) and sometimes not in the following cases. 1) You use に ( = ni) with 末 ( = sue/matsu ) at the end. = Raigetsu no sue ni Kyoto ni ikimasu. = I will go to Kyoto at the end of next month. = Shuumatsu ni doko ka (ni) ikanai? = Do you want to go some place on the weekend? = Kono ryokou wa shuppatsu no nikagetsu mae ni moushikonde kudasai. = Please apply for this trip two months before the departure date. = Soredewa, mata isshuukango ni ha no chiryou ni kite kudasai. = OK, then please come back in a week for dental treatment. = Kotoshi juu ni atarashii kuruma wo kaitai. = I would like to buy a new car by the end of this year. = Ichijikan inai ni kaette kite kudasai. = Please come back within an hour. = Hitobanjuu, kodomo no kanbyou wo shiteita. = I was taking care of my sick child all night long. = Hawai wa nenjuu atatakai. = Hawaii is warm all through year. = Rainen no haru (ni) Ousaka ni hikkoushimasu. = I will move to Osaka next spring. = Kotoshi no natsu (ni ) finrando ni itta. = I went to Finland this summer. The literal meaning of ~ になる ( = ninaru) is to turn, to become, to change into ~. = Sanji ni nattara oyatsu wo tabete iiyo. = You can have a snack when it turns 3:00. = Goji ni naru made kaerenai. = I can’t go home until five. = Hachiji ni natte mo shigoto ga yamazumi da. = Even at eight, I have tons of work. = Kyou ni natte mo mada musuko kara renraku ga nai. = Ashita ni natte mo moshi mada taichou ga warukattara oisha san ni itta hou ga ii yo. = If you are still under the weather tomorrow, you should go see a doctor. = Sonnani yukkuri shukudai wo yatte itara ashita ni nacchau yo. = If you are doing homework that slowly, it will be tomorrow (before you finish). = Sumimasen. Ni ji ni natte mo irassharanakatta node hoka no kata wo saki ni tooshite shimaimashita. = I am sorry. Since you weren’t here by 2:00, we let other guests in. = Juuichigatsu ni naru to kyuu ni samuku naru. = It suddenly becomes colder in November. = Nihongo nouryoku shiken no benkyou wo zutto sabotteita ga, juunigatsu ni haitte aseri hajimete kita. = I have been slacking off on studying for JLPT but I have started to feel uneasy since the beginning of December. = Kotoshi ni haitte mada ichido mo kanojo ni atte inai. = I haven’t seen her even once this year. = Nijihan kara konnsaato ga hajimarimasu. = The concert will start at 2:30. = Kono kurasu wa ichiji kara niji made desu. = The class is from 1:00 to 2:00. = Koukan ryuugakusei no boshuu wa nigatsu kara rokugatsu made okonatte imasu. = The application period for the foreign exchange students is from February to June. = Nisen juunen kara nisen juuninen made nihon ni ryuugaku shiteimashita. = I was studying in Japan from 2010 to 2012. = Itsumade nihon ni iruno? = Until when are you going to be in Japan? = Rainen no haru made imasu. = I will be here until next spring. = Shiken wa ashita made desu. = The exam will finish tomorrow. = Kyou kara fuyuyasumi da. = The winter holidays start today. = Maggie sensei wa nisen hachinen kara kono saito de nihongo wo oshiete imasu. = Maggie Sensei has been teaching Japanese on this site since 2008. = Kare wa kanojo to wakarete kara ( or irai) zutto ochikonde iru. = Sakuya, kuji goro (ni), jishin ga arimashita. = There was an earthquake around nine o’clock last night. = Ashita, daitai, sanji gurai ni atsumarou ka? = Why don’t we get together tomorrow around three? = Kyonen no imagoro, nani wo yatte ita? = What were you doing around this time last year? = Kare wa konogoro, chotto yousu ga okashii. = He has been strange lately. = Saikin, nihongo no benkyou wo ganbatteimasu. = I have been studying Japanese hard lately. I said you don’t need a particle に ( = ni) with 今日 (= kyou) today, 昨日 ( = kinou) yesterday , 明日 ( = ashita) tomorrow, but the confusing part is we use a particle, は ( = wa) with them. = Kyou wa, ii tenki desu. = It is nice today. The weather changes everyday, but (at least) today is nice. = Getsuyoubi wa isogashii desu. = I am busy on Mondays. = Kyonen no imagoro wa shinagpooru ni imashita. = I was in Singapore around this time last year. So you can simply emphasize a certain period of time, a certain day, a certain month, a certain week, or a certain year by using は ( = wa). Or you can show contrast when you do something special at a particular time period. Note: You can omit は ( = wa). By adding は ( = wa) , you can express tomorrow is a special day or doing something different on that day. = Kyou, gakkou ni ikimasu. = I will go to school today. = Kyou wa, gakkou ni ikimasu. = Kyou, gakkou wa yasumi desu. = There are no classes at school today. = Kyou wa gakkou wa yasumi desu. = Kinou, kaimono ni itta. = I went shopping yesterday. = Kinou wa kaimono ni itta. = Ashita , tsuri ni ikimasu. = I will go fishing tomorrow. = Ashita wa, tsuri ni ikimasu. = Nishuukan, onaji hoteru ni taizai shimasu. = I will stay at the same hotel for two weeks. = Nishuukan wa, onaji hoteru ni taizai shimasu. = Raishuu, kaigi ga arimasu. = We have a meeting next week. = Raishuu wa kaigi ga ariamsu. = Kaigi wa raishuu desu. = The meeting will be held next week. = I will manage to make it by tomorrow. = Kyou made niwa maniawaseru to ittajanai desu ka? = But you told me that you would make it by today. = Suminasen. Ashita no niji made niwa kanarazu subete owarasemasu. = I am sorry. I promise to finish everything by 2:00 tomorrow. = Sanshuukango niwa mou nihon ni ite Aichan no yoko ni iruyo. = I will be with you in Japan in three weeks, Ai-chan. = Goshinpai wo kakemashitaga, ashita niwa mou yoku natte iruto omoimasu. = I am sorry to make you worry but I think I will be better by tomorrow. = Rainen no haru niwa aou ne. = Let’s get together (at latest) in next spring. = Ashita no goukon, tanoshinde ne. = Enjoy your group date tomorrow! = I haven’t heard from my son until today. Although/Even though the day/date turned today, I haven’t heard anything from my son. →I haven’t heard from my son until today. But doesn’t until today mean you heard something from your son? Ahh now I see the problem. You are right.Sorry. I will change the translation. Hi. I’ve been visiting this site for quite some time now. I just wanted to let you know how much I appreciate these lessons and how much I find them helpful! Thank you for your nice message, Valentina!!! If I would have translated this sentence into Japanese, I would have written: この旅行の出発は2ヶ月前に申し込んで下さい。 So, in my sentence の would be used to modify 出発. But I don’t quite understand its function in your sentence. It kind of sounds like a relative clause, in which　の replaces the が, but I don’t know. So what kind of の is 出発の２ヶ月? 2.明日から夏休みが始まります。 Can you use は after　明日 in this sentence or do you have to use から? You sometimes put the word you want to emphasize first. You use から because the summer vacation will start “from” tomorrow. Kyou ni natte mo mada musuko kara rennraku [renraku] ga nai.